I surrendered my life to Jesus in 7th grade, at a youth retreat in Ortley Beach, NJ. A few years later, I received the baptism in the Spirit at a local coffeehouse in Metuchen. Through those early years I was blessed to lead home groups, teach the Word, counsel, lead worship, and share the gospel through music, drama, and many other means. In 1978 I married my lovely wife Debbie, who has been an unfailing help and support all these years. We are blessed with three children, all now adults. In the late 80’s, Mark Chironna prophesied my destiny as a prophet, so I embarked on a season of training under the ministry of Bishop Bill Hamon, at Christian International, in Santa Rosa Beach, FL. Throughout the 90’s I ministered prophetically and served in various other capacities within the context of the local church, which included public recognition as a prophet and elder at Christ Fellowship, Elizabeth NJ. After the turn of the millennium, the Lord began directing me back to His foundational life-calling for me: to disciple and equip His people. As a result, I developed a prophetic discipleship program which gave me the privilege of personally serving over 30 people, helping them grow in their sensitivity and obedience to the voice of the Lord. 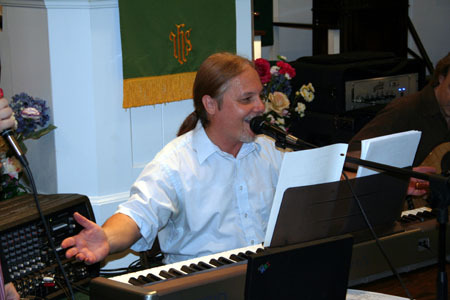 In 2005 it became clear that the Lord was directing us to look beyond the local church setting and prepare to serve the wider body of Christ in our region, and so in July of 2006 we were officially released from our local church (Christ Fellowship) to begin a trans-local ministry we called FireSong. We began serving at the Harvest Training Center, Cranford NJ, helping to build a 24/7 regional house of prayer (at that time called The Furnace House of Prayer) while also offering a twice yearly Kingdom Discipleship/Prophetic Training course. Graduates of this course are qualified participate in the Prophetic Rooms ministry at the House of Prayer, which serves dozens of people every month. In early 2010, The Furnace relocated to its own facility and the name was changed to The International House of Prayer: Eastern Gate. FireSong has done a weekly 2 hour prophetic worship set there for 5 years. In addition to the Harvest Center and the Furnace, we also aligned ourselves with other local and international ministries: Metro Apostolic Network, lead by Bishop Frank Dupree, Glory of Zion, directed by Chuck Pierce, and Global Legacy, a network established by Bill Johnson and Bethel Church of Redding, CA. It's also my privilege and pleasure to serve on the Apostolic Council for Metro, and as one of the Board of Directors for Street Life Ministries, directed by my good friend David Van Fleet. In February of 2009, I was honored to receive ordination by Bishop Dupree, under the auspices of Metro Apostolic Network. Also in 2009, I entered a year long training program at Lifeforming Leadership Coaching to become a credentialed Life Coach and Coach Trainer. At the end of 2009, I along with Clem Salerno and Frank Dupree, launched a new concept in Christian discipleship called Kingdom Training Institute. KTI is a Regional Apostolic Equipping Center, established through a partnership of local leaders, whose common vision is to see the Body of Christ equipped, trained and released into their God-given purpose and destiny, both in the local church and the 7 mountains of society. In the Fall of 2010, the FireSong team and I launched a "new wineskin" called Heaven's Invasion. This is a weekly regional gathering where Jesus, the King of kings is actively recognized and honored as Head, and Whose Presence is our highest value and priority. It's an informal, family-style gathering where there's food, fellowship, testimonies, sharing from the Word, and worship. But most of all, it's an opportunity for Jesus to move in our midst to do whatever He desires. Russ was ordained February 22, 2009 by Bishop Frank Dupree and The Metro Apostolic Network. The Harvest Training Center / Calvary Tabernacle, Clem Salerno, Senior Pastor. Feel free to contact any of the above for their endorsement of ETR Destiny / FireSong. This site is © Copyright 2011 FireSong Ministries. All Rights Reserved.